With a focus on innovation, multinational stamping company Pridgeon & Clay, Inc. (P & C), Grand Rapids, MI, has created value for its customers by combining the disciplines of advanced engineering, an A2LA accredited laboratory, design, prototyping, research and development and Six Sigma manufacturing. The company is committed to more than just producing good parts; it’s committed to providing engineered solutions for high-volume production. For more than 10 years, P & C’s A2LA (American Association for Laboratory Accreditation) laboratory has evolved well beyond merely supporting the company’s inhouse production-manufacturing operations. Along with conducting metallurgical analyses for the automotive components P & C stamps and assembles, the lab also markets a variety of testing services to other manufacturers, and even to P & C competitors. Housed in a separate facility, P & C’s lab offers complete confidentiality and security, while specializing in product-validation testing. Its numerous materials and product tests range from grain structure and chemical analyses to durability and destructive testing. The lab delivers accurate results in a timely manner. P & C developed an in-die spin-form process. conjunction with the A2LA laboratory is a team of engineers dedicated to providing data-driven solutions to guide improvements in products and processes. The cornerstone of the company’s commitment to innovation, the P & C advanced engineering department employs several analytical methods, including simulation and finite-element analysis (FEA). The team offers analysis to a variety of industries, and boasts an extensive knowledge base of material science as it pertains to metal forming. Proficient in virtually all types of CAD software, the P & C design group affords the company and its customers top-level product-design support for projects ranging from single components to full systems, and also provides die-design and print-generation services. Not only is this a valuable asset to P & C’s customers, it also helps the company ensure a steady supply of innovative products and designs. P & C uses all hardened tool steel and mechanical presses, providing its customers with manufacturing analysis months before actual product launch, and it can yield an interim PPAP submission in less than four weeks. P & C has developed a number of self-contained systems to aid in the atomization and mixing of diesel exhaust fuel. Apropos to the 2003 passage of more stringent Corporate Average Fuel Economy standards, P & C is continuing development of its SCR process. Pridgeon & Clay has worked with several OEMs and Tier 1 companies to design, build and test countless SCR systems that detoxify exhaust emissions, many of which are in production today. 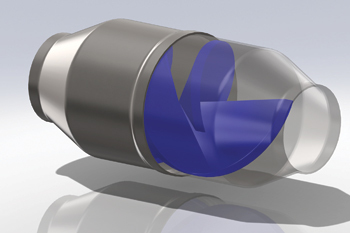 One of P & C’s latest developments is the ability to spinform in-die at a rate of 30 strokes/min. This eliminates a typically costly offline operation. Replicating the die conditions in a lab environment was key to the engineering group’s ability to refine and execute this development. The process stemmed from the lab’s work on the reverse-extrusion process. As metal is extruded to form an eyelet or flange, the displaced material tends to elongate, resulting in a material-thinning condition by as much as 30 percent. See also: Pridgeon & Clay, Inc.